Can statistics make you happy? Maybe if you’re a stats geek like me, but seriously can the path to happiness, or at least some insights into the path to follow be found through the use of statistics? The Office for National Statistics (ONS) have been engaged in work to create a quantitative measure of our national well-being and despite some criticisms in the mainstream media, along the lines that in many cases it was either pointless, or a case of stating the obvious, the work, carried out on a large scale, has produced some interesting results and points to a number of areas for future research. As the well-being data has been collected through the Labour Force Survey the analysis so far seems particularly revealing about the work we do, or indeed don’t do (though this is perhaps also a weakness as the data reveals less about other non-work factors) and in this post I will be dealing primarily with these issues of work status, occupation type and their relationship with life-satisfaction. The most immediately striking thing about the well-being stats is the affect of age. 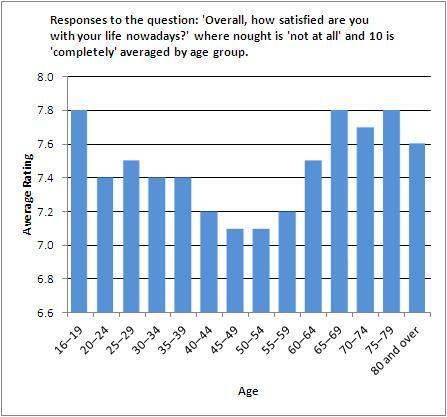 According to the ONS figures well-being follows a ‘u’ shaped curve according to age as shown by this graph referring to responses to the question ‘Overall, how satisfied are you with your life nowadays? in which respondents were asked to give a rating on a scale of 0 -10 with 0 being not at all and 10 being completely. 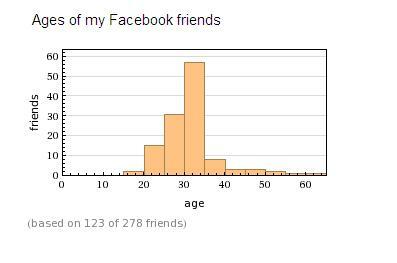 What could be the reasons for this similarly high ratings given by members of the older and younger age group? One thing both groups also have in common is their level of satisfaction of the amount of free time they have. 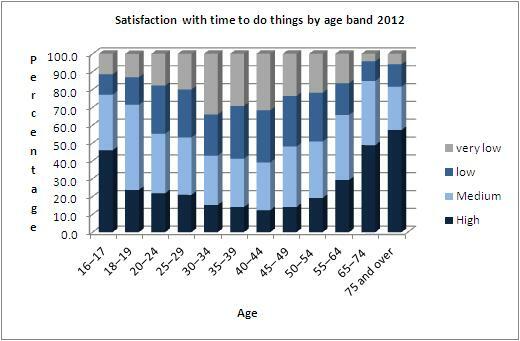 When asked ‘if they were satisfied with the amount of time to do the things that they like doing’ both younger and older people reported the highest levels of satisfaction. Source: Opinions Survey, Office for National Statistics. Data collected in October 2011, February and June 2012. It is quite likely that these higher levels are chiefly because both groups are less likely to have family commitments, or to be engaged in paid-work; For younger people this is because they are still in education, whilst for the older age group many of those aged 65+ will be retired from paid-work. As a slight aside an interesting observation is that whilst in general life satisfaction appears to increase with age, this actually declines for the 80+ age group. 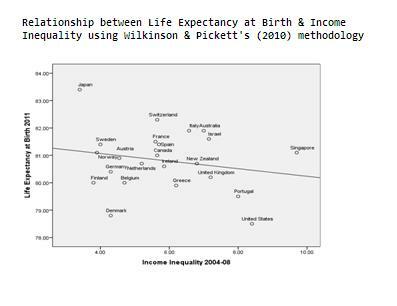 There may be a number of possible explanations for this; one being poor health, which is in the ONS analysis also implicated in lower levels of well-being, or an alternative may be that social capital declines at this age leading to isolation. 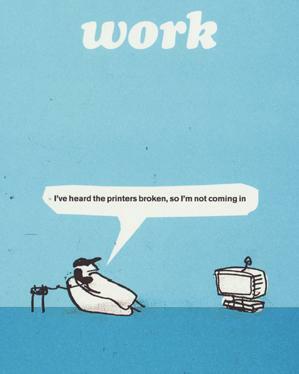 So in terms of work is it that not working the answer to happiness? Well, not quite. 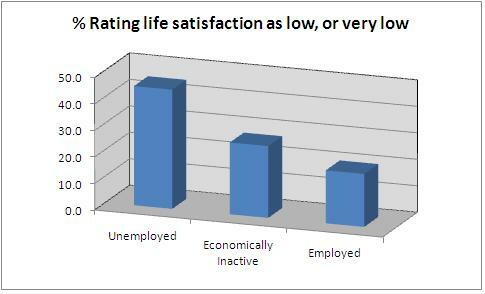 The well-being statistics also showed that unemployment has a significantly detrimental impact on the level of well-being reported by an individual with 45% of unemployed people rating their life satisfaction as low (5-6), or very low (0-4). This compares with a much lower figure of 20% for people in employment whilst for economically inactive people this figure is 27.1% However, this latter category includes people who are caring for a relative, looking after children, or who are unable to work due to illness/disability along with students, the idle rich and retired people, who we may possibly expect to have higher ratings – indeed more people in the economically inactive group, some 30.5% also rated their life satisfaction as high (9-10) compared with 24.4% of employed people, and 16.3% of unemployed people suggesting this is a rather bifurcated group. 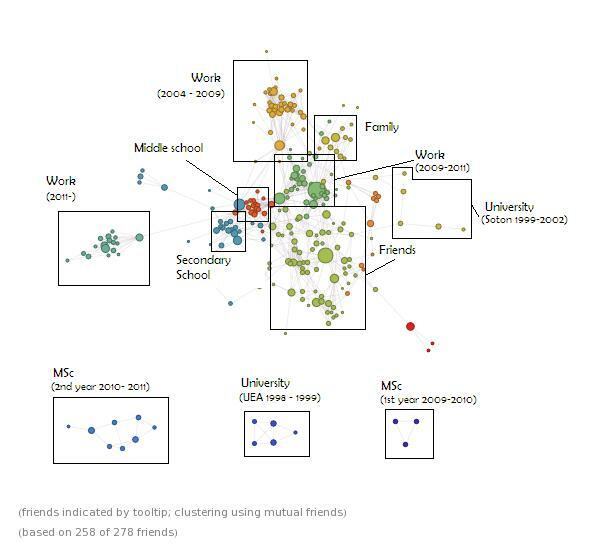 Because of this wide variation among the ‘Economically Inactive’ group it is particularly hard to reach any conclusion without breaking down the category and though we can clearly see that being employed is clearly far more preferable from a well-being perspective to being unemployed – something which may well be due to the stigma and low status of being in the unemployed group – an interesting comparison to make would be between the unemployed and the idle rich. Annual Population Survey (APS) – Office for National Statistics. Data from April 2011 to March 2012. But can the type of work we do have an effect on well-being – yes, according to the ONS analysis which states that in terms of the ‘life satisfaction’ ratings, and sthe ‘how happy did you feel yesterday’ question. While it is common for demands to increase as the occupational hierarchy is ascended, degree of control over work decreases with lower position. Whitehall II provides ample documentation of this: the lower the grade of employment, the less control over work. This combination of imbalance between demands and control predicted a range of illnesses. The evidence from Whitehall II suggested that low control was especially important. People in jobs characterised by low control had higher rates of sickness absence, of mental illness, of heart disease and pain in the lower back. 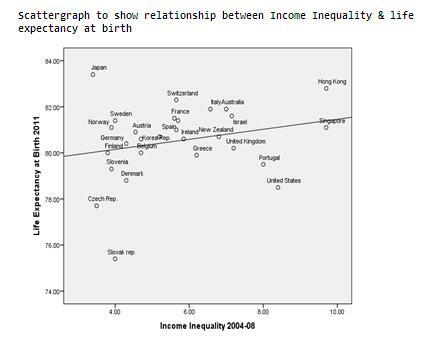 Whilst there is likely to be a correlation between level of control and remuneration as this was not controlled in the analysis it is not possible to tell form the data if higher levels of pay alone can increase well-being. One interesting finding however, is that those in the occupational group ‘caring, leisure and other service occupations’ as well as those in ‘professional occupations’ achieved the highest average response to the question ‘overall, to what extent do you feel the things you do in your life are worthwhile’ at 8 out of ten. the lowest averages were reported by ‘sales and customer service occupations’, ‘process plant and machine operatives’, and ‘elementary occupations’ who all averaged 7.5. This would seem to suggest that work which involves a level of altruistic motivation, or else purports to serve a higher purpose, is beneficial for overall well-being, compared to work in which financial reward is the primary, or sole motivation. This finding is particularly relevant to questions into the role of social purpose, or public service in work and in organisations in general. Could it be that individual well-being is enhanced within organisations such as social enterprises, or other voluntary organisations where there is a strong sense of social mission? In terms of the ONS well-being data it would appear that both younger and older persons, groups who due to their respective ages tend not to be engaged in full-time paid work, report both higher levels of life satisfaction, and higher levels of satisfaction with the time to do things. Though it is not necessarily the case that it is simply full-time work that results in lower levels of satisfaction in both measures for the other age groups, and it may certainly be the case that other commitments such as looking after children also play a role, it does seem possible that full-time work, can result in dissatisfaction with the time a person has to do things and this in turn may well be linked to the corresponding lower levels of reported well-being for these age groups. 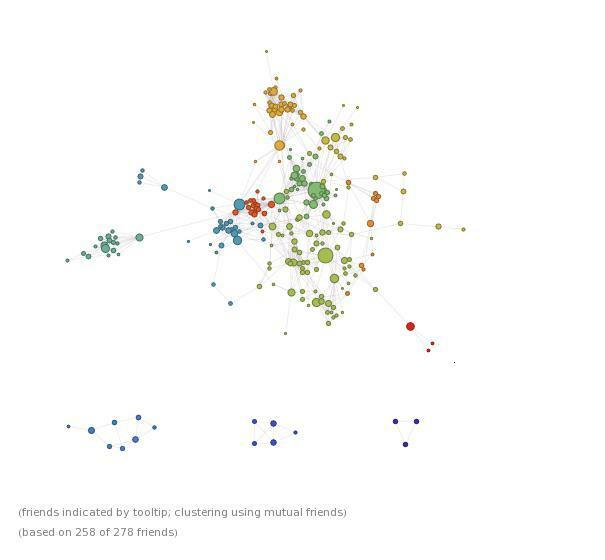 Certainly this is an area where future research may be directed as the ONS analysis does not include any details on the relationship between well-being and hours worked, or with a persons satisfaction, or not, with the hours they currently work. Finally It is also important to note that the LFS does not collect data on voluntary work. It may be the case that, particularly among the retired group, voluntary work may play a key role in well-being. A 2005 Joseph Rowntree Foundation paper Volunteering in Retirement, suggests that voluntary work can be particularly beneficial for the health of retired people. As mentioned the ONS analysis seems to suggest that work which performs a higher purpose is beneficial to well being therefore it may be interesting in particular to analyse the role of voluntary work, or more widely make a comparison of well-being levels between workers in the voluntary, or public sector and the private sector.